Scouting, including the Sea Scouts is a wonderful way to develop and mature as a young person. It certainly helped me and it seems Victron Energy Sales Manager Margreet Leeftink in her youth too – to the extent she still stays in touch with her old group. One of Margreet’s old Sea Scout group (Jesse Berends) takes up the story of how maintaining contact has been of benefit to all. Never a bad thing! Thanks must go to Jesse for his hard work in putting this guest blog together and Roos van Belle for her photographs, without which this blog would be incomplete. 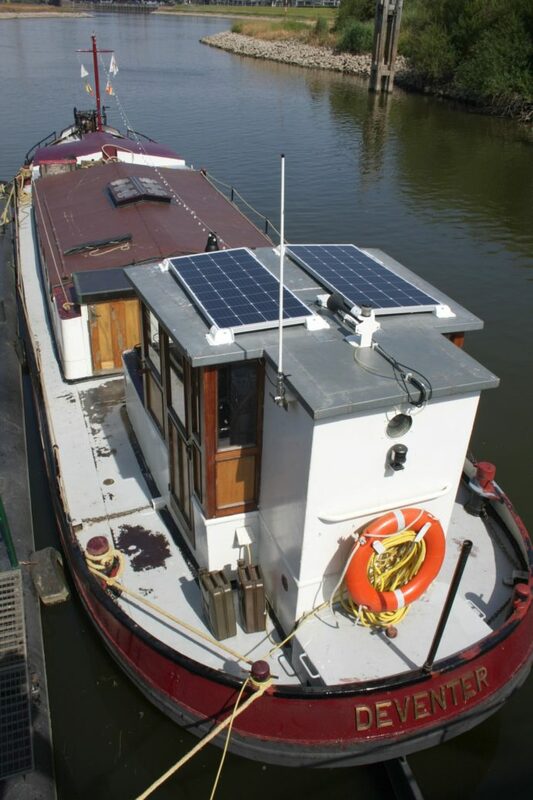 In the past few years we have fantasised many times about installing solar panels on our boat (we like to call it a ship). In those same years, it always ended with ‘it has no priority at the moment’ and at the end of 2017, the same thing was going to happen. But then Victron Energy employee Margreet Leeftink, who is an old member of our scouting club, visited us for a cup of coffee to take a look at our broken secondhand Victron MultiPlus 24/3000/70. As a consequence she said she could arrange a good deal for us on some solar panels and some extras. This was our chance to finally be able to install solar panels on our ship! Before I go further, l shall explain some things. The ship on which the solar panels will be installed is called Clasina, being the mothership of the Sea Scouts in the Dutch city Deventer. 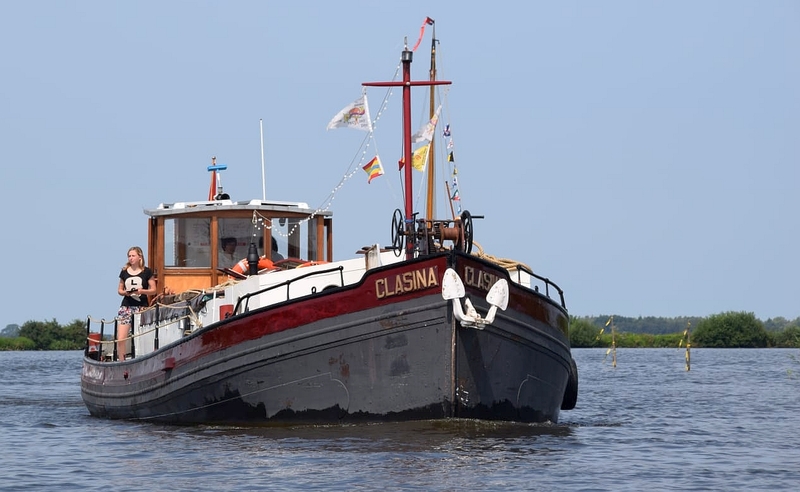 Clasina is a 90 year old vessel that has been used until the late 1950s to maintain the waterways in Holland. 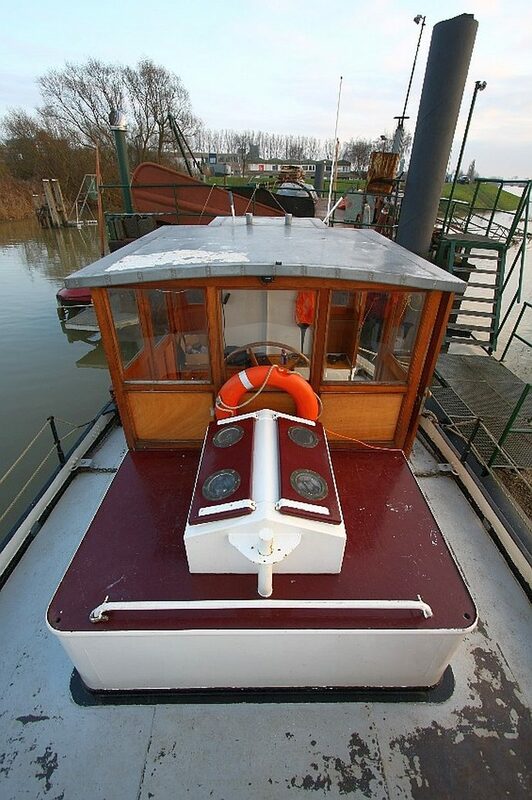 She is a 17 metre long and 4.2 metre wide (58 x13 ft) vessel, maintained by a handful of volunteers on a tight budget. Kids can start sailing with us from the age of 7. In total, we have around 35 youth members, divided into groups aged 7 to 11 and 11 to 16 years old. The kids sail in small sailing boats. A few times a year we go on a sailing camp with our boats. 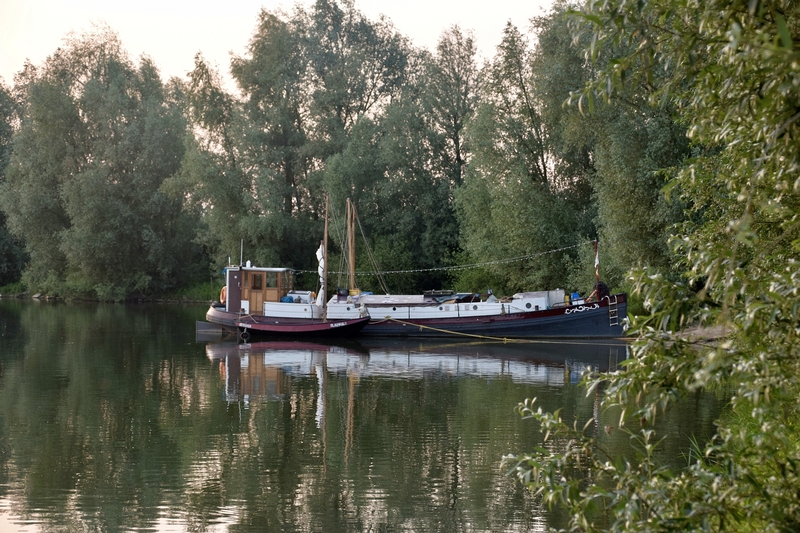 On our longest camp, we sail through a water rich area (Friesland) in the Netherlands for more than two weeks. On those camps we use Clasina as a mobile clubhouse. There is no power at the places where we stay overnight. So as not to disturb other people, we try not to use our generator and so to keep our large 230-volt refrigerator running we are depending entirely on our batteries. We only charge them while driving the ship to another campsite. But that’s not enough to top up our batteries every day. We solved that problem with a large battery capacity, but unfortunately due incorrect use and a faulty electrical installation our batteries always fail within a few years – resulting in buying expensive batteries again and again. In 2017 we thought that it was getting ridiculous to buy those batteries every few years, so we decided to overhaul our electric installation so that the batteries would last longer. This meant that we had to remove all the old do-it-yourself projects of all the previous volunteers and built the whole installation up again. In the spring of 2017 we overhauled the 230-volt installation and now it’s time to do the same for our 24-volt DC system. The old installation can be seen in the photo below. Left of the picture is the Victron MultiPlus 24/3000/70. It charges our batteries when connected to shore power and gives us AC power when we are not connected. On the right of the MultiPlus the (already overhauled) AC circuit breaker box can be seen. Before the shore power enters the MultiPlus, it goes through an earth leakage circuit breaker (small box on top). Behind some wires, the Victron VET can be seen. This allows us to charge both the engine and domestic battery with the alternator on the engine without the battery packs interacting with each other. The box held by the strings below holds the fuse for the MultiPlus and holds a shunt for the battery monitoring. 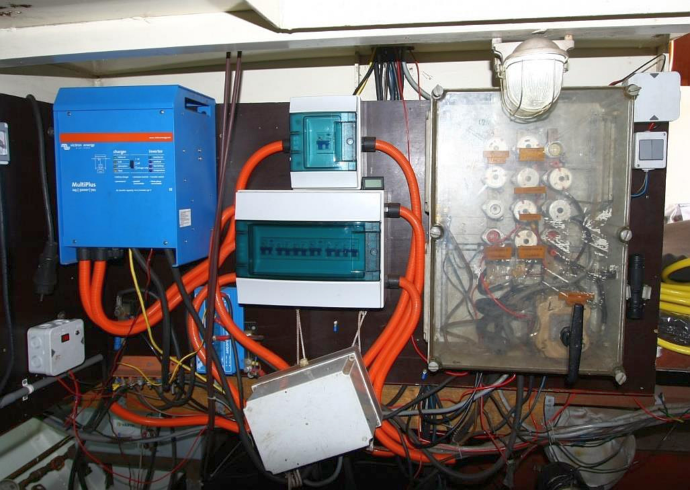 The large box at the far right is the 24-volt fuse box with the main switch. The fuses inside are for home installations and are not tripping as fast as they should. Our current installation is already beginning to look much better. 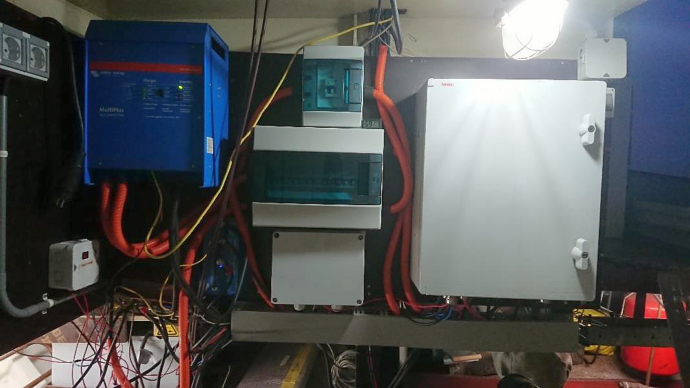 The DC fuse box is replaced with a better one and our two shunts (one for the battery monitor and one for the ampere meter) are placed in a dedicated box as well. Also, we replaced all the wires that distribute the power through the boat. With most of the work out of the way and a 15 day summer camp around the corner, we decided that the solar panels should be installed. The wheelhouse roof was the best place to locate the 2 x 150 watt panels. There’s no shadow and a low risk of damage. Also the roof is close to the engine room, the only area not accessible to the kids. After we had removed the braces for the navigation bar and the bar itself, we had a large unobstructed flat surface to put the panels on. First we bolted the corner pieces on to the panel frames. After they were bolted tight we secured the panels on the wheelhouse roof. To avoid leaks we only used glue to secure the panels to the roof. We are aware of the fact that it is not possible to remove the solar panels anymore, but as we leave the boat unattended most of the time it is nice to know they will not come off easily. During the installation we kept the top of the cardboard on the panels. This way they were not generating power during the installation. After we had put the panels on the roof, we ran the wires through the boat to the engine room. The solar panels are connected in series to create a 24 volt system. To protect the connection from the weather we used a junction box, also glued to the roof. The MPPT 100/20 was placed in the engine room near the batteries. The negative wire coming from the roof was put directly to the MPPT. The positive wire is connected via a switch. This way we are able to isolate the panels from the system when needed. We didn’t have to wait long to test the system. 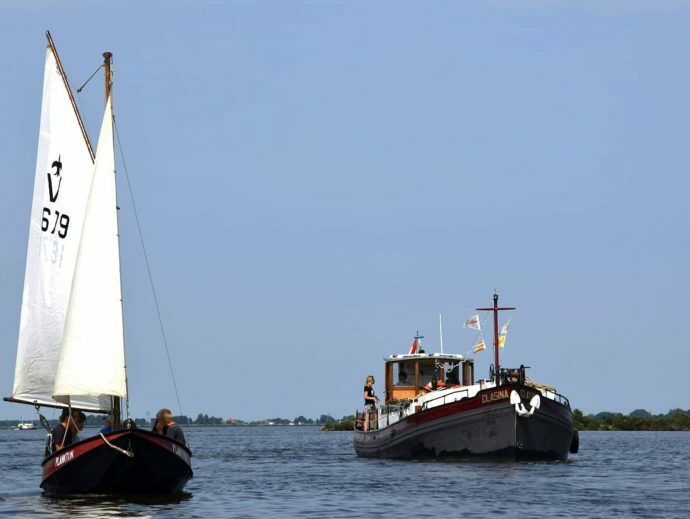 Just a day later, we set sail to Friesland for the summer camp. With a historical hot summer in Holland we already had a sense that not having enough power was not going to be an issue anymore. The biggest test was at the beginning of the camp. We stayed on an island in Het Tsjûkemar for four days without running the engine and with no access to power. The weather was warm and we had to run the refrigerator constantly (also overnight) to keep the food for 20 people fresh. With a battery capacity of 225 Ah we would not be able to keep everything running. Fortunately, with the solar panels we managed to keep the refrigerator running for three days though, without starting the engine or generator. Also we didn’t have to worry much about using the lights onboard and charging our phones. On day 4, our batteries were (finally) at a point that we really had to charge them. However, for the rest of our camp we didn’t need to worry about power or generator noise now we have solar. Our estimate of solar harvest and use has proved correct, allowing us to keep a silent ship! 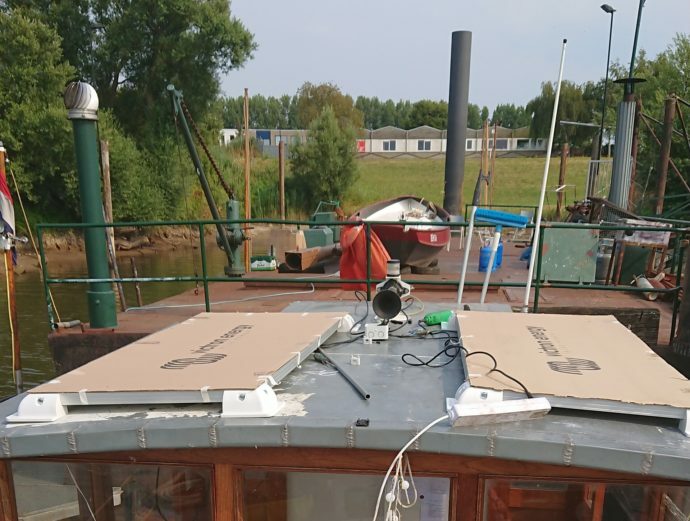 Shown below is Clasina on a pontoon berth with the completed solar installation keeping the batteries topped up between trips – and not having to use any of the connected shore power you can see – whilst we dream of our next adventures on our scouting mothership Clasina. Without Margreet’s and Victron Energy’s support none of this would have been possible and for that we would like to say a big thanks to you all.